Six months after my first jump into the mysteriously beautiful river of Matutinao, I came back to double the experience, this time with friends for more than 10 years. It still gave me a lot of chills and still as enjoyable and mystical as my first. Finally, a repeat happens! Supposedly, we arrived in Cebu early in the morning. However, due to ‘operational limitations’ of Cebu Pacific, we arrived at around 12nn. This means that we have limited time to explore Cebu City. And truly, we were all in a rush visiting Temple of Leah, Taoist Temple, Sto. Nino Church, Magellan’s Cross and our lunch in Larsian. We rented a van via Robes Pension House for only Php2,500.00 for four hours of use. For eight heads, I think this is not bad especially that the temples are on highlands that only habal-habal and taxi (aside from private cars) will dare to drive thru that will cost hundreds as well per head. So we decided to use their service for convenience while it’s cost-effective. If you can be in cebu as early as possible the better so you can enjoy every spot you’ll visit. We arrived in Matutinao before 7pm and we were surprised by a breakfast prepared by Kuya Yoyoy and his wife. We went to the drop off area before 8am, however, the jump off point was totally different from the first time I went there. We have to trek for around 30 minutes and it wasn’t easy!! Mind you, the moment you hear the flowing river, the descend gets steeper. PS: Budget to canyoneering is already PHP 1,500.00 including lunch and gears. I always tell this to those who comment in my previous post that you better be early in whale shark watching registration area so you can be in first batch. Like what we did, we’re done before 7am. Hence, we can afford to stay longer in Sumilon Island. If you’re not visiting Simala Church, you can check Tumalog Falls. It’s one of the best places to visit in Oslob. So there, If you have questions, feel free to message me. If you’re only a group of five, you may also want to check my previous post about South Cebu Adventure. 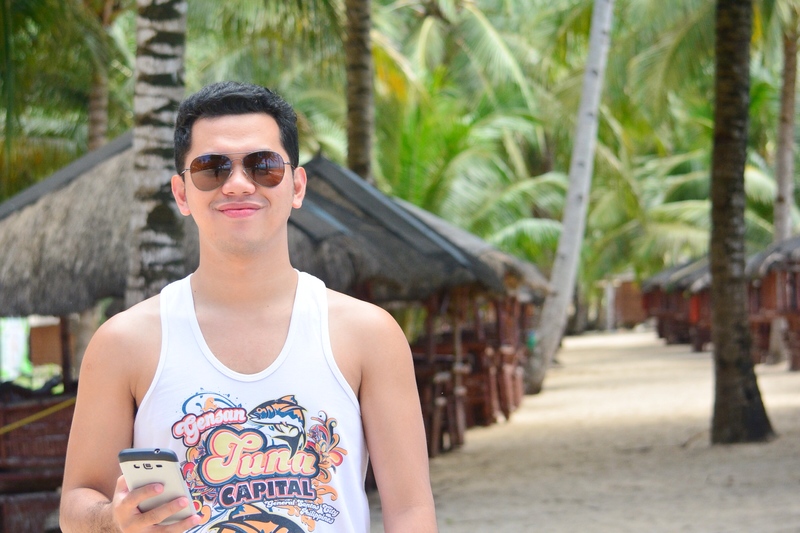 Pingback: Budget and Travel Itinerary: Canyoneering in Badian | Kawasan Falls | Whale Shark Watching in Oslob | TonSanity. Hi Sir Ton! Nice blog post, pwede ko po bang malaman kung same van lang yung sa going to simala and going back to cebu city yung ginamit nyo? and is it private? Hi Kim, yes same van, private van kasi yun. Pero you may want to visit my prev post posted last may. Nagbus kami from oslob to simala. Convenient naman yung biyahe. Ask ko lang san nyo nakuha yung van for worth 2500 for city tour? Do u have any contact nunber? Q1: Yung van po ba going to simala and going to cebu city iisa lang? and is it private van? Q3: Sa mismong site po ba kayo nagpabook sa Robes Pension nung una po nyong punta? Hi Kim, yes private van sya. We were able to contact a van in oslob na pauwi ng cebu. Walang syang sakay so kami na lang. win-win for both of us. But dont worry kasi maraming bus na dumadaan papuntang sibonga (where simala is) then, tricycle papuntang simala church mismo. May isa akong blogpost na nagcommute talaga kami using bus. Check mo sa blog ko around may of this year. Mas ok kung unahin mo kawasan. Magcanyoneering ka pa ba? Sa oslob kasi, better to be there as early as 5am para hindi ka mahassle kakahintay ng turn mo mag whale watch kasi mahaba talaga ang pila. Pwede mo na lang tawagan robes. Pero manghihingi sila ng 50% downpayment. Ahhh ok thank you po sir Ton, napakalaking tulong po itong blog post mo and yung reply mo po sa akin for our next year travel sa Cebu :) . How much naman po yung binayaran nyong van? and do you have a contact of the driver? 180 each lang. Pero ganun yung presyo kasi lugi sya kung babalik sya ng cebu from oslob nang walang sakay. Kaya tinapat lang nya yung presyo nya sa presyo ng bus. I doubt he can still give it at that price. Most of the time kasi pag magrerent ng van, you pay fix amount regardless kung ilan kayo. Hello kent, ilan kayo pupunta dun? Group of four sir, and another pala madami po bang nag oofer ng boat ride going to sumilon doon sa area at reasonable price? I forgot to ask about sa New Oslob Village, did you booked or walk in lang? and Saan po kayo nagrent ng L3 Van? Nagbook kami. May 50% downpayment lang pero ok naman. Yes, nung 5 kami, nagtricycle lang kami. But recently nagrent kami l3 van sa new oslob village mismo kasi mas convenient at since 8 naman kami maghahati-hati, cost-effective na rin. 3 lang kayo right? I guess better magtricycle lang kayo. Anyway, may mga tricycle naman sa highway. 10 po kami sir Ton, pero back and for na rin po ba yun? and may kilala po ba kayo na private van from kawasan to oslob new village? It’s okay kim!! Baka may tour sya kanina. Text mo lang ulit hehe. Hi Juvai. Here is for new oslob village: 09235301371. For robes, you may google it and search their website. Di ko pala nasave hehe. Hi Kuya Ton! After Canyoneering ba, igguide kami ni Kuya Yoyoy kung saan sakayan going to Oslob (for whaleshark and sumilon island tour)? HM po yung tour to sumilon island? Copy that Kuya :) may entrance fee po ba sa sumilon, hm po? Hi Ton! Kung saan saan n ako ngcocomment. Ask ko lang, yung 50 php n entrance sa Sumilon is ano ang pwede nmin magamit n facilities nila? If we want to use their swimming pool, magkano po kaya yung fee? Thank you! That i do not know also hahahaha. But you can search blue sumilon beach resort. The entire sumilon island kasi is a private property. They just allow non-guest to visit the shore for 50pesos. Yun lang. other facilities, including resto, are for guests only. Try this: (this is my first IT in my south cebu adv). Budget and Travel Itinerary: Canyoneering in Badian | Kawasan Falls | Whale Shark Watching in Oslob | TonSanity. kanang 1500 mao na e bayad kay kuya nonoy?mao na ang fix payment sa ila?sila mokuha sa amo pag abot sa Matutinao Church? Ask ko lang if anong bus yung sinakyan nyo going oslob from kawasan falls and yung from oslob terminal and from oslob terminal to oslob proper. And sir ton additional question from ur Itinerary, ask ko lang about dun sa Van na sinakyan niyo from simala going to cebu city (city tour plus airport transfer). Rent po ba yun or punuan? Rent yun. Pabalik kasi sya sa cebu kaya lang wala sya pasahero so we negotiated for the price. But anyway, may bus naman going to cebu. Dadaan yun ng simala. Pero may van sa simala. Punuan yun going back to cebu. what grade would you give the whale watching? is it worth the early wakeup and hustle to be in first queu? Very worth it. You save a lot of time. 10 for the experience. Just make use of the only 30 mins encounter. Hi ton, is it possible na mag moalboal island hopping kmi after ng canyoneering (option A) or mas okay kung island hopping muna bago magcanyoneering (option B)? yes. nacontact na nmin si kuya yoyoy.. hehe.. Sige ask nlng namin sya. Thanks. Yap, mas alam nya e hehe. Thank you also! Thank you for sharing abby!! Ill update this blog to include his account. Thanks again!! Hi sir ton! Ask ko lang po kung may rental van din po ba sa oslob going to kawasan? Were 10pax included kids kasi. Baka hustle sa kids kung mag bus 2 transfers. Pabaligtad kasi iti namin kc manggaling kami sa dumaguete so mauna kami sa whale shark? Do you have contact no. Van rental? Thank you po. Thank you and God Bless! Hi po. Magkano po binayad niyo sa sumilon island po?